HVH "Street Sweeper" 1" carb spacer for 4150 series carbs used on dual pnae intake manifolds like Performer RPM Air Gap, Brodix HV-1016, Dart Kool Can, and etc with cut out in plenum divider. 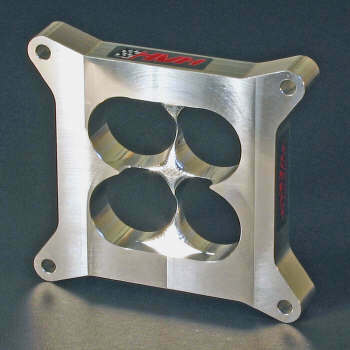 These are the only spacers specifically designed to improve the performance of the following intakes when using a 4150 Holley: Performer RPM Air Gap, Brodix HV-1016,and Dart Kool Can. Designed for any dual plane intake manifold that has a "window" in the top of the plenum divider. These "Street Sweeper" spacers are manufactured from high quality aluminum using the latest cnc equipment for dead accurate reproduction and unsurpassed reliabilty.